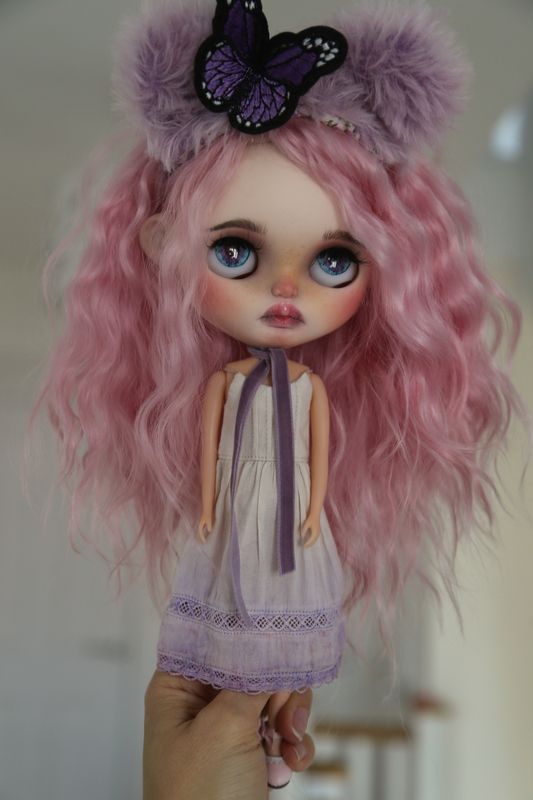 Bernadette is a sweet little butterfly girl with cotton candy hair. She's a tiny bit shy with people and prefers the company of butterflies and flowers. Her favourite singer is Adele and her favourite food is vanilla ice cream. She is looking for a like-minded soul to look after her and treasure her forever. Bernadette's lips are slightly open with two little teeth, visible at certain angle, her ears are cute and big enough to tuck some of her locks behind. Her hair is a beautiful soft angora reroot in candy pink with a silky shine and softness. The hair is very rich and naturally wavy. 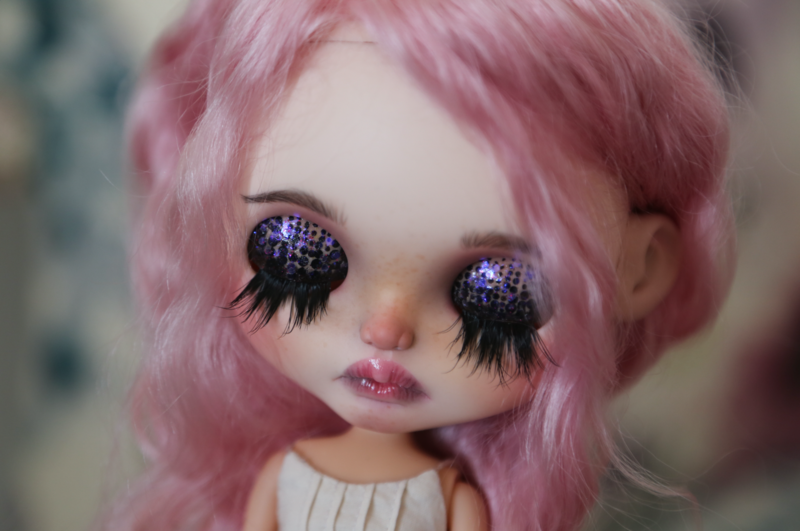 She is on a Licca body (can be changed to original one or Azone). 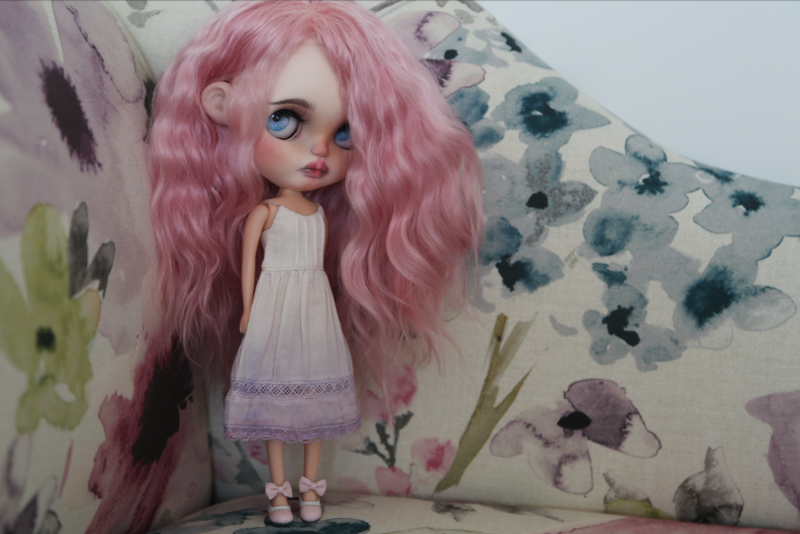 Bernadette will arrive in a Miss Blythe dress with tie-dye effect in natural colour with the bottom part in purple shades. I made for her purple teddy headband with purple butterfly with light purple ribbon ties; white and pink stripy scarf. She has cute pink sandals, as on photos. 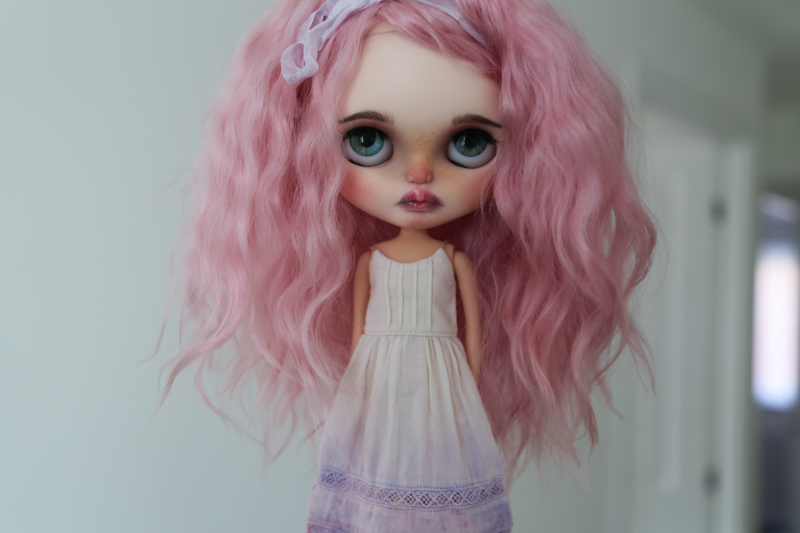 Bernadette is a handmade art doll and is intended for a doll collector. 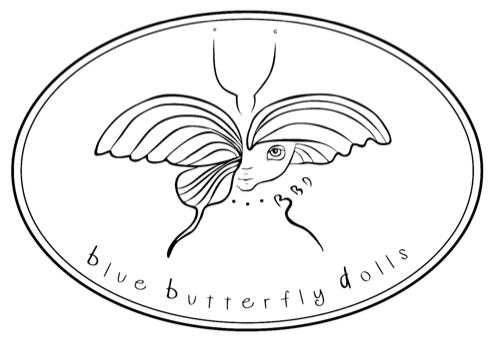 She is a unique, one of a kind doll which can only be created once and therefore is not reproducible. I've created her with hours of dedication and all of my love. Note that colours displayed by computer/tablet/smart phone screens may vary slightly from the reality, and therefore please keep this in mind. The doll was photographed in various light/shade conditions to help show the colours more truly, the photographs were not enhanced with filters. For shipping - I use International Royal Mail Signed for and tracked where possible; Next Day Special Delivery within UK. Courier/EMS type of shipping is available upon request. Returns are not accepted, but please do contact me in case of any issues. Bernie is ADOPTED, thank you!